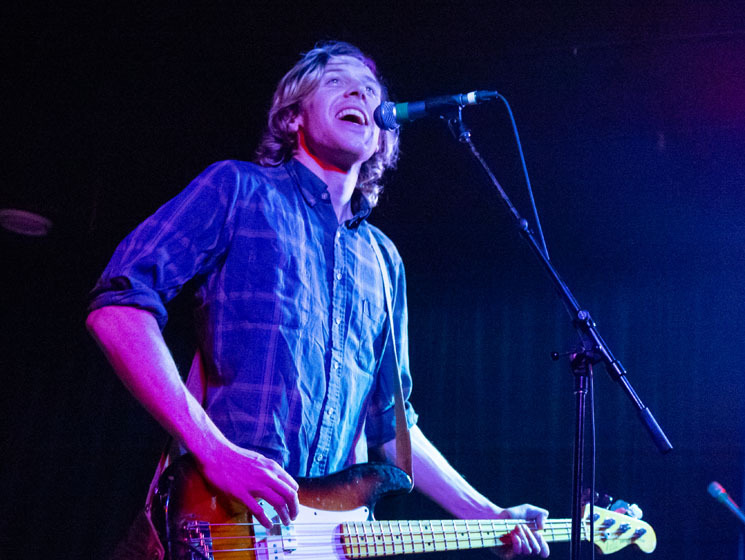 It has been a couple years since Ontario's Tokyo Police Club rolled through town, so it seemed fitting the band would be part of the Good Will Social Club's four-year anniversary celebration. This was only the second date of band's headlining North American tour; it can sometimes be a rough spot at the start of an extensive tour, as some groups need a few dates before hitting full stride. That wasn't the case for TPC, who seemed like they were dialled in with each other from the opening buzz of guitars. Although the group are known for their explosive starts, a lot of the new material takes more time to make its impact. Opening with "DLTFWHY" from their recent self-titled album, the slow build and mid-tempo pace set the tone for the night, with the band playing a lot of their newer material. The trio of "Hercules," "New Blues" and "Simple Dude" came together nicely, but it wasn't until "Boots of Danger (Wait Up)" that the band really peaked, with the capacity crowd energetically singing backup. Maybe it's a holdover from other TPC shows, but the set list in Winnipeg didn't do the band any favours. It's not that songs like "Hands Reversed," "Not My Girl" and "Edgy" aren't snappy enough, but the set seemed like it could have been shaken up a bit to ensure a more balanced dynamic and smoother transitions between songs. Its obvious from the band's terse drums, sharp guitars and lucent keyboards, their sound continues to be refined but expanded at the same time. If you like Who-style whirlwind guitars and blistering solos, the contrast with the rest of the band's sound seems to draw even more attention to them now, which in this case is a good thing. The only missteps were "Ready to Win," which is the weakest song on the new album, and singer David Monks' earnest attempt to take requests from the crowd, which turned into indiscernible shouting matches for the next three songs. Next time just give the crowd what they end up asking for anyway: "Nature of the Experiment" or anything off of A Lesson in Crime.